The goal of a customer journey map is simple: to teach organisations more about their customers. Here's a good intro to customer journey mapping. What bearing do these guidelines have on your own mobile site’s UX and its SEO value? Here's a rundown of what you need to know. Let's take a closer look at one of the top ecommerce trends of 2017: simple, smooth, distraction-free ecommerce experiences. In this chat roundup, we discussed how UXers adapt to shifting UI. We’re joined by Nathalie Zeitoun, UX and Digital Media Officer. Our talking points: How are interfaces changing? What’s being added/removed? How can UXers make use of these interface changes to improve UX? Where do you see UI in a few years? A list of most common deliverables produced by UX designers as they craft great experiences for users. 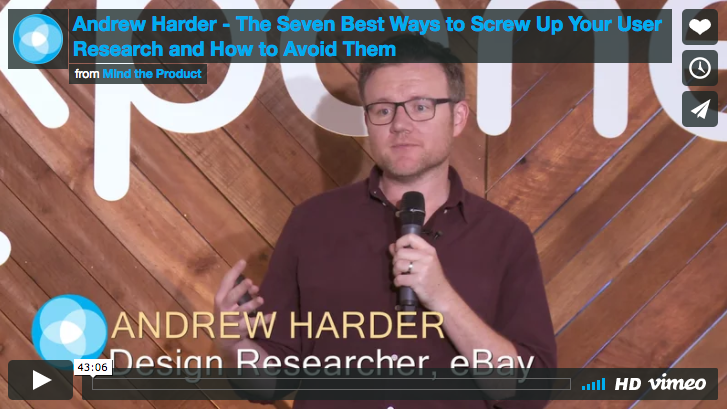 In his talk, Andrew Harder, Design Researcher at eBay, picks the top seven mistakes he's made over the years, and shared insights on lessons learned from them. Enterprise UX — which refers to the design of business products — is in the middle of a renaissance. UXPin surveyed 3,157 designers, developers, and product managers to gather insight into how business products have evolved — and where they’re headed next. This data suggests that the most typical ratio in organizations is 1 dedicated designer for every 20 developers and 1 dedicated researcher for every 100 developers. There is a fair amount of variation and some caveats with these ratios. If only we put more energy into avoiding future problems rather than solving present ones we previously created, we’d make significantly more progress in less time.